The mission of America’s first Mobile Riverine Force was to penetrate the delta stronghold of a determined enemy. The US Navy’s first hospital ship, USS Red Rover, was a part of that historical Mississippi River squadron. That vessel was refitted to provide the medical support required by the soldiers and sailors of the Civil War. In the next century a similar situation came about. Our nations second Mobile Riverine Force (MRF) was encountering an enemy seeking shelter in the extensive waterways of the Mekong River delta. Once more, close medical support was provided by men who faced the task and developed their own special vessels. From the first MRF in 1863 to the second in 1967, many changes have occurred in the conduct of warfare. The Army Medical Department has kept pace and continues it’s mission to preserve the fighting strength of its units. The Mobile Riverine Force in Southeast Asian was a joint operation comprised of the US Army’s 2nd Brigade, 9th Infantry Division and the US Navy’s River Assault Flotilla One Task-Force 117. The transportation of this joint force was accomplished by using two principal types of vessels: the barracks type ship for housing troops for long moves on the rivers, and the smaller craft for assault landings and security missions. The larger ships were designated Self-propelled Barracks Ships (APB’s). These were reconstructed Landing Ship Tank (LST) class ships. The assault craft were reconstructed Mechanized Landing Craft (LCM-6) boats. After the addition of armor plate and various weapons, one of the boat types was referred as an Armored Troop Carrier (ATC). Several of the ATC’s were fitted with Helicopter Landing pads. 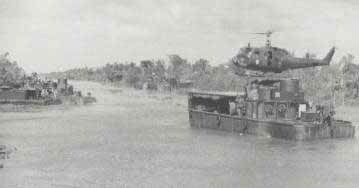 The ATC(H)’s with the landing pads were used by the medical platoons of the force infantry battalions as medical aid boats. One ATC(H) was also used by an element of the medical company of the division medical battalion as a medical aid boat which was used in support of the joint Army/Navy operations. The medical aid boat used the bunks that were attached to the inside cargo deck hull. This allowed for the management of five litter cases. Due to the small working area, it was necessary to revolve patients in and out in the shortest time possible. Ambulatory patients had to climb the up and out of the cargo deck or, in the case of litter patients, be handed up in the space between the end of the flight deck and the landing ramp of the boat. The vertical distance from the cargo deck to the flight deck was ten feet. The flight deck was constructed from steel runway matting welded over a framework of pipe. 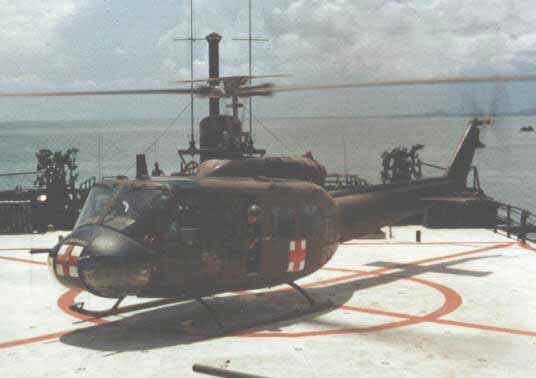 The primary drawbacks in using a boat of this type for close medical support was the lack of illumination for night operations and the small size of the pad, which always required of the pilot great skill to effect a safe landing. Some of the medical equipment present on the aid boat included a basic field medical and surgical set, and a whole blood mechanical refrigerator. The medical personnel consisted of one medical Corps officer, seven enlisted medics, and a radio operator. A three-day level of supplies was maintained. Unit level medical service was furnished by the medical aid boat, manned by the medical platoon from the infantry battalion. This aid boat would accompany the ATC’s carrying the assault troops. Under the direction of the battalion surgeon, the aid station was operated at the point where the troops disembarked to start the sweep. It would remain there until the ATC’s began to move to the predesignated troop pickup point. At this time, the aid station would close up and return, unless the tactical situation required it to reopen at some other spot. Division Level medical service was provided by a medical aid boat manned with medical personnel from Company D, 9th Medical Battalion. This medical company aid boat was normally positioned in the vicinity of the barge-mounted artillery fire support base. This location provided security, a central location with regard to the area of operation, access to communications, and close liaison with the brigade operations center. The casualties from the operation could be evacuated to the aid boats or other medical facility by either water or air. The vast majority were handled by air ambulance. The Pilot had the choice of taking the casualty to one of three facilities. These were, 1) the forward element of the medical company located at the fire support base; 2) the medical company itself; or, 3) the surgical hospital. The latter two were located at Dong Tam, the MRF base camp. The evacuation decision was made by the helicopter pilot after consideration of casualty condition and the distance to be flown. As riverine operations moved farther into the delta, time and distance pointed out the need for changes in the concept of medical support from all levels. If a curved line had been drawn, connecting Dong Tam, Saigon, Long Binh, and Vung Tau late in 1967, five American hospitals would have been on or near that line. When the MRF operated east of Dong Tam, inside the area created by the curved line just mentioned, evacuation time to a hospital was very short, the main reason being the location of several helicopter ambulance units at Long Binh. Conversely when operations were conducted west of Dong Tam toward the Cambodian border, or southward toward the U-Minh forest, the line of air evacuation was stretched to the limit. The only American ambulance unit located in the Delta was at Soc Trang. To offset the complete lack of military hospitals and limited air ambulance capabilities deep in the delta, there was a variety of air ambulance shuttle systems, utilizing air ambulance from the units at Long Binh. The decision that the MRF should have an enlarged medical treatment and holding capacity was the beginning of the solution. Another aspect of the solution was the deployment of an evacuation hospital at Can Tho. To effect the increased medical mission, many types of boats and ships were considered and, in the end, it was decided to use an APB rather than add another vessel. In December 1967, the APB-36 USS Colleton, was sent to Subic Bay Naval Base, in the Philippines to have her sick bay enlarged. The ship was back with the flotilla in January 1968. Also in January of that year, the medical brigade assigned three personnel to D Co, 9th Medical Battalion. This consisted of one general surgeon and two male nurses. Level one was the flight deck of the ship. It was large enough to allow the landing of any type of helicopter. All approaches were controlled by Navy radio operators, and the landings were made under the direction of the Navy. This, plus the white or red illumination for night Landings, provided the helicopter pilots with visual controls and contributed to safer operations. The materials necessary for the direct exchange of litters and blankets were stored on the flight deck. The triage area was next and immediately below the flight deck. It was reached via a two section ramp. This ramp was wide enough for two way traffic. The ramp’s half-way point was large enough to allow litters to be rotated completely, without any stopping or shifting. Outside of the entrance to triage was slightly lower and wounded soldiers were stripped and washed off with warm water at this point. This prevented debris from collecting in the triage room. It also contributed to easier determination of the extent of the injuries. Near the shower on the weather deck was an electric winch. It was rigged to swing out over the side of the ship. This was used to hoist up casualties that arrived by boat (ATCs) shipside or any other type of vessel. The winch and litter combination made it unnecessary to move casualties through narrow passageways and up steep ladder wells. Inside the triage room, there were six treatment positions always set up. More could be easily erected if needed by using litter stands. Liquids, dressings. and other materials were distributed at each treatment point. Medics or corpsman circulated and replenished supplies as they were consumed. To assist in the rapid diagnosis and treatment of casualties, a 50 mil x-ray unit in a fully shielded enclosure was located in triage. The wide double doors allowed easy entry of litters, and the automatic plate developer provided rapid evaluations. A blood bank and an autoclave were also located here. The third area was on the second covered deck of the ship. This air-conditioned area was reached by using a wide single stage ramp, which was attached to the port side of the hull. On this level, and grouped about a common passageway, was a two table surgery, the central material section, storage area, recovery area, ward, pharmacy, and a one chair dental clinic. Surgery was provided with it’s own ventilation system, to reduce the chances of cross contamination and infection. Central materials section had an autoclave which was operated from the ship’s steam system. When the patient load exceeded the 18 beds available in the primary ward area, additional bed space was obtained by using a portion of the petty officers quarters. This area was just aft of the ward. In addition, some patients were sent to convalesce in their own bunks, located in the troop compartments. In essence. the entire bed capacity of the Colleton could have been used which could have been up to 900 beds or bunks if needed. The only limitation were those regarding the ability of the assigned medical personnel to provide the high level of care expected of the Army and Navy medical departments on the Colleton. Any patients sent to the troop compartments were cared for by the battalion medics, and returned to sick bay for outpatient treatment and follow-up. Medical personnel representing unit, division, and army level medical service, plus the normal medical complement of the ship were quartered on the Colleton. When the infantry battalion troops were not engaged in combat operations, the battalion surgeon and his medics conducted a daily sick call in the troop compartments. If necessary a man would be referred to sick bay for more extensive treatment. The Navy doctor did the same for the ships company and boat crews. During any period when casualties were being received from an area of operations, all medical personnel worked as one team. No distinction was made as to branch of service or unit. In these situations, the required professional guidance was provided by the general surgeon, who was an Army Medical Corps Officer. For each operation, a medical evacuation helicopter was placed in support of the 82nd Medical Detachment. The crew stayed on the ship, and responded to missions that were handled by the communication section from D-Company. Table I gives a breakdown of all the regularly assigned medical personnel on the Colleton. Not included are the personnel of the infantry battalion medical platoon or the air ambulance crew. The USS Colleton, with her enlarged sickbay, was back in operation only a few days prior to the 1968 TET offensive. The capability of it’s medical facility can be seen in the following statistics. During the 94 day period between 29 January 1968 and May 1969, the Colleton handled a total of 890 casualties. This represents only the casualties evacuated to the ship and is exclusive of the daily sick-call. Of 890 casualties received, 690 were classified as having received injuries due to hostile action (IRHA). Three hundred forty-five of this group were returned to duty after initial treatment. One hundred thirty four men were admitted to the ship’s ward and completed their entire course of treatment without leaving the MRF. The remaining 411 casualties were evacuated to the next higher level of medical treatment, after receiving emergency life saving treatment and stabilization had been achieved. 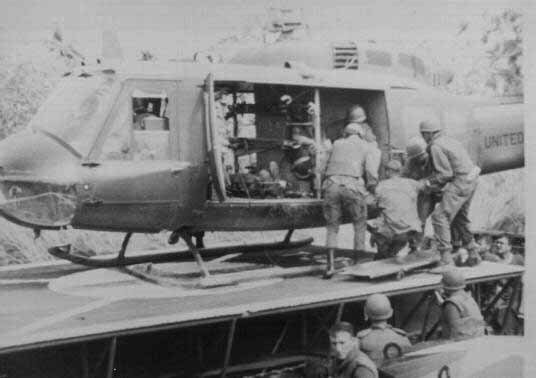 The evacuation hospital at Long Binh was the usual destination for personnel from the Colleton. From the beginning of MRF operations in the delta, several medical support ideas existed. These ideas overlapped not only a number of command lines but also normal boundaries of the levels of medical service. All were aimed at overcoming a distance factor that was reducing the medical support of the MRF. In the final conclusion, the mission stayed with the division medical battalion, a logical selection. By augmentation with the medical brigade personnel and in the presence of the Navy medical complement, the basic deficiency was corrected; there was immediately available for the combat troops a facility capable of performing definitive life saving procedures. In the evolution of the medical support to the Mobile Riverine Force, we can see that there was no easy solution and that the measures applied were subject to change. The skill with which the changes were conceived and executed served to point out the close and meaningful communications which existed between all levels of the Medical Departments. In the end, the time honored and proven level of medical service saw the creation of a facility that overlapped the normal parameters in terms of personnel, equipment, and missions. The workable solution, in the form of the USS Colleton medical facility, was important in and of itself, but it also depicts a flexibility on the part of the medical support planners in both the Army and Navy Medical Departments.